Thrawn begins the backstory of Grand Admiral Thrawn, perhaps the most fearsome non-Force user in the Empire. 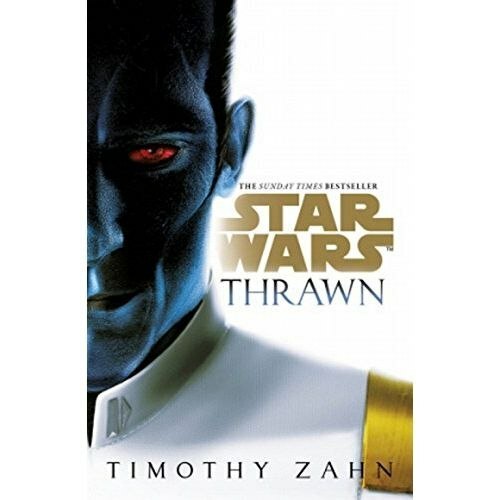 Timothy Zahn's Heir the the Empire series introduced Grand Admiral Thrawn. The blue-skinned, red-eyed, master of strategy and tactics inspired decades of speculation and debate. Then Star Wars Rebels re-introduced Grand Admiral Thrawn as the super villain intended to crush the nascent Rebellion. I was thrilled. Sadly, Thrawn was kind of a doofus and not nearly as tough for the Rebels to get around as I'd hoped. That said, Thrawn was still fascinating. A blue-skinned non-human who appears a peer with Darth Vader? I wanted to know more and luckily Timothy Zahn was brought back to flesh out the story. Marooned on a deserted planet for simply suggesting a non-standard approach to solving his people's problems, Thrawn is discovered by the Empire. The blue-skinned alien who outwits dozens of Imperial Troopers is taken to Coruscant to meet the Emperor and enlisted to help subdue the dangers of the Outer-Rim. This adventure is a fantastic story, but learning Thrawn's motivations and backstory have set me down the path of reading the entire trilogy.